Table 3 summarizes the effects of the interventions on medical and LTSS utilization. For most of the studies we reviewed, there were no significant changes in medical utilization (noted as NS). One study found a significant effect of care coordination on medical utilization: Callahan et al. (2006) reported fewer office visits in the intervention group. Likewise, for most of the studies we reviewed, there were no significant changes in LTSS utilization. Two studies found lower nursing home placement rates in the intervention group. Results were mixed for home health and personal care services, respite and day care services, and other supports. Below, we highlight the effects of care coordination on psychosocial outcomes. Table 3 provides further details on each study's findings for caregivers and care recipients. * = Significance not reported; NS = Not significant; --- = indicates that outcome was not assessed/reported. AA = Alzheimer's Association; ADLs = Activities of Daily Living; OT = occupational therapy; PT = physical therapy; RT = respiratory therapy. Bass et al. (2003) found that persons with dementia in the intervention group had less difficulty coping with memory problems. The program described by Callahan et al. (2006) showed a reduction in care receivers' behavioral and psychological symptoms at 12 months, which persisted 6 months after the intervention. In the Lewisham study, there were improvements associated with care receivers' ADLs, health, behavioral difficulties, and the environment. In addition, persons with dementia were more satisfied with their home environment 6 months into the study and showed improved social contacts (Challis et al., 2002). Judge et al. (2011) found an improvement in most psychological outcomes for persons with dementia and their caregivers. Six of eight psychosocial outcomes were better in the intervention patients than in the comparison group (AHRQ, 2012). The French study reported by Nourhashemi et al. (2010) found no significant differences between groups on patients' functional decline. Specht et al. (2009) reported an improvement in functional ability among persons with dementia 3-9 months into the program. Although Vickrey et al. (2006) observed a smaller decline in quality of life in the intervention arm, confidence in caregiving, caregiving mastery, and ratings of health care quality for persons with dementia were higher for participants in the intervention group. Bass et al. 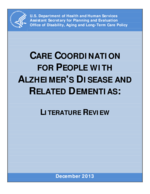 (2003) reported that caregivers who used other Alzheimer's Association services in combination with care coordination experienced reduced symptoms of depression, role captivity, and health deterioration. Role captivity was measured using survey items that measured feelings of being trapped, wishing to run away, and wanting to be free to lead [the caregiver's] own life. Similarly, health deterioration was measured with survey items which asked about getting sick more often, having worse physical health, having less energy, and being bothered by aches and pains. Callahan et al. (2006) reported that caregivers in the intervention group had reduced symptoms of distress at the end of the intervention and improvements in depression at the 6-month assessment. The Lewisham program (Challis et al., 2002) found that caregivers reduced their total caregiving hours and felt less burden and distress. Chu et al. (2000) reported that caregivers in this program experienced reduced burden and had fewer occurrences of disturbing behavior by persons with dementia. The MADDE demonstration resulted in improvements in caregiver stress and burden at some, but not all, sites (Newcomer et al., 1999). Caregivers in the care coordination program also reported fewer tasks with which they required assistance. Jansen et al. (2011) in the Netherlands reported no significant difference in caregiver quality of life, depressive symptoms, or burden between the intervention and control group. The other Dutch study, reported by Meeuwsen et al. (2012), found no significant difference in outcome measures (caregiver quality of life, burden, and sense of competence) across the two randomized sets of clinics. The PDC program in the VA found that eight of 11 psychosocial outcomes were better among caregiver participants than those in the comparison group (AHRQ, 2012). Specht et al. (2009) reported that caregivers had lower odds of both extensive and substantial stress at 3-9 months and extremely/compromised well-being at 9-15 months relative to those in the control group.